This is a great cookie jar! Take a look! Made of nice quality ceramic by StoneLite. 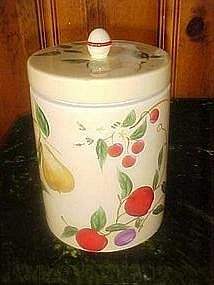 Has a freshness gasket where the lid fits to the jar. Hand decorated with various fruits, plums, pears, cherries, and apples on a pale tuscan yellow background. A very generous size measuring 10" tall. Thes cylinder shape cookie jars have lots more room than the figurals. Pristine condition!